Ali here once again, with an elegant box-card. I have to say that the Lawn Fawn Scalloped Box Card Pop-up Die is the most versatile die I own. 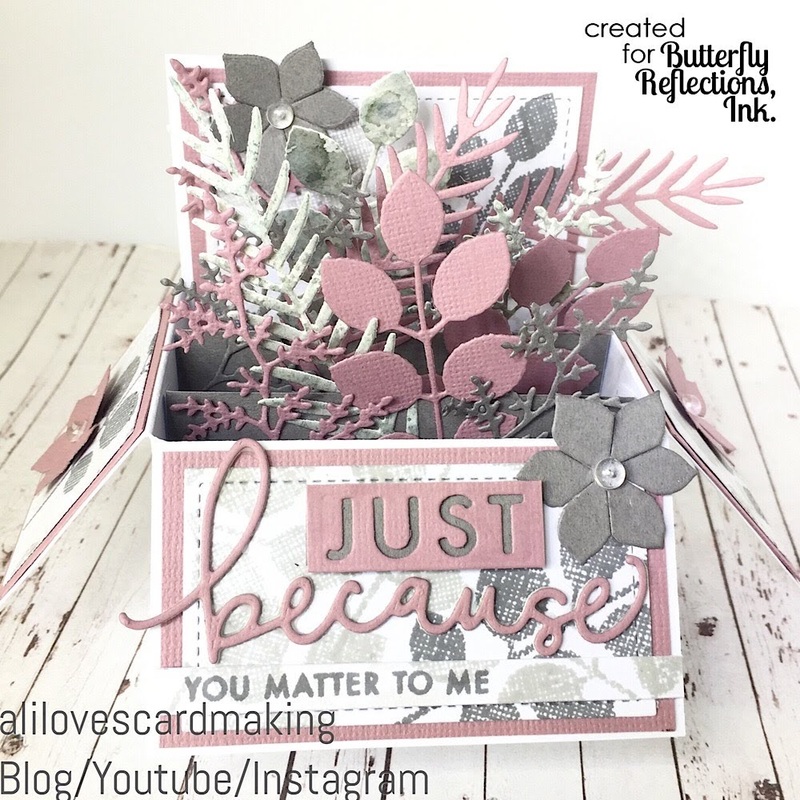 It's such an easy way to get a lot of "wow" with your cardmaking and can be used to create loads of different 'styles' of cards. You can make it as simple or as complex as you like and it always impresses!! 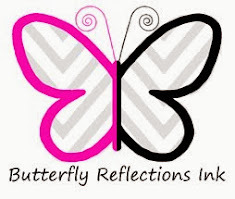 What I love about them is that they are not just for kids cards and that adults love them as well! 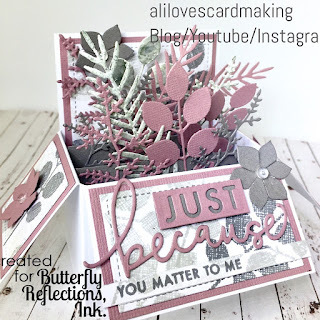 This time, I combined it with the Just Because stamp and die sets from Concord & 9th to show you that a box card can be elegant and 'pretty' too. The first thing I did was cut two of the Lawn Fawn dies from white card and assembled them to make the box-card - it really is simple and not difficult to do at all! I trimmed the scalloped section from the flaps as - well, to be honest, I'm not a huge "scallops" fan (but it's so easy to just trim them off if you are like me!!). I used grey card to put inside the front of the two 'internal strips'. Next I made my own background paper by stamping the leaf image on some white card with Altenew (rock collection) inks in a random overlapping pattern. I used the die to cut some panels from this background card (with stitched feature) for the rear, front and side panels. 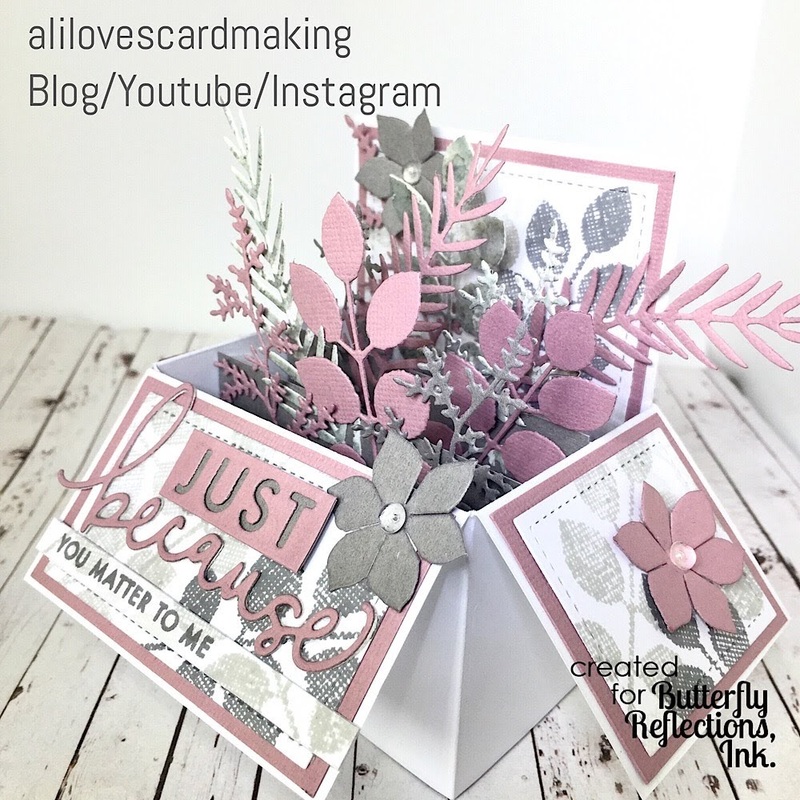 I backed the panels with some of the dusky pink card to make a small coloured boarder and attached them all to the box-card. I then cut flower/leaves and sentiments using the dies from a dusky pink card, grey card and from some scraps of card that I had smooched grey distress ink onto. 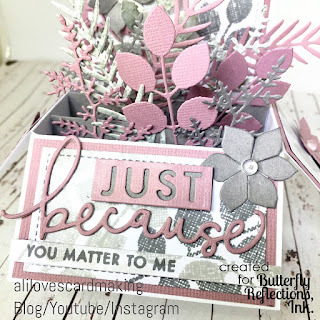 I stamped the "you matter to me" sentiment on to a strip of the background paper. 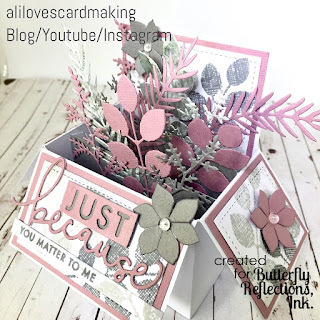 I attached all the leaves/flowers and words/sentiments with my multi-medium mat glue. Lastly, I added some small Pretty Pink Posh water droplets to the centres of the flowers. Of course it flattens perfectly to place in the envelope!